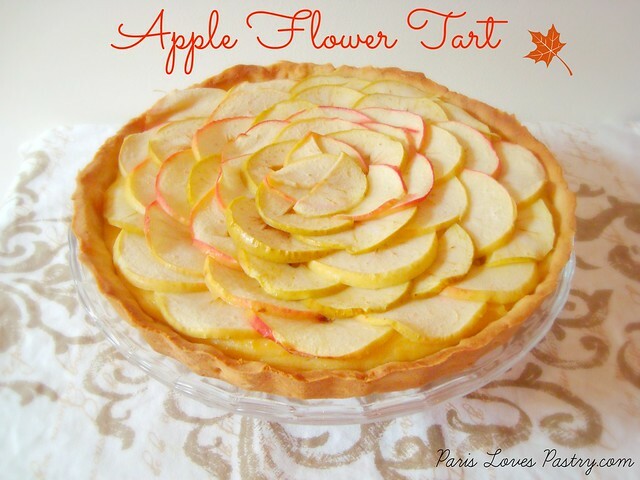 I'm sending you off into the weekend with this Fall recipe: an Apple Flower Tart. The layers of apple slices are arranged to look like a rose. 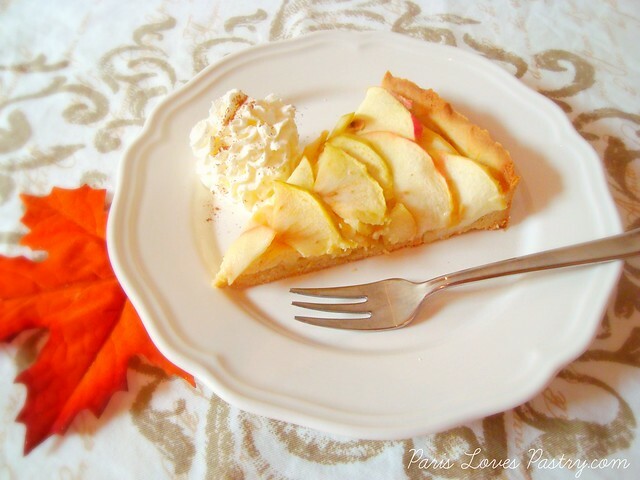 Indeed, it was an apple rose tart that inspired this recipe. Truth be told, my version is a failed recipe. I initially wanted individually roses in the tart. But my rose-making skills proved to be far behind so I went for something easier. But definitely not any less lovely. Rating: 4 out 5. Apple Flower Tart: adapted from Yoli's blog. Sweet Tart Dough recipe, click here. - Preheat the oven to 350C. Pre-bake your tart crust for 10 minutes. - For the cream, mix the flour with the sugar, vanilla and orange zest. Add egg yolks and a little milk. Stir to a smooth pulp. Pour the remaining milk and wine. Boil the cream and let it cool. Optionally, you can use some instant cream or vanilla pudding. - Half the apples, and slice them very finely. Make a sugar syrup by putting the water and sugar in a pan above high heat. Let it come to a boil. when it boils, leave it like that for a minute or two. Then, lower the heat and stir to dissolve the sugar, about 3 minutes. Pour the hot mixture over the apple slices in a bowl. Let the apples soak in the sugary syrup for 5 minutes. 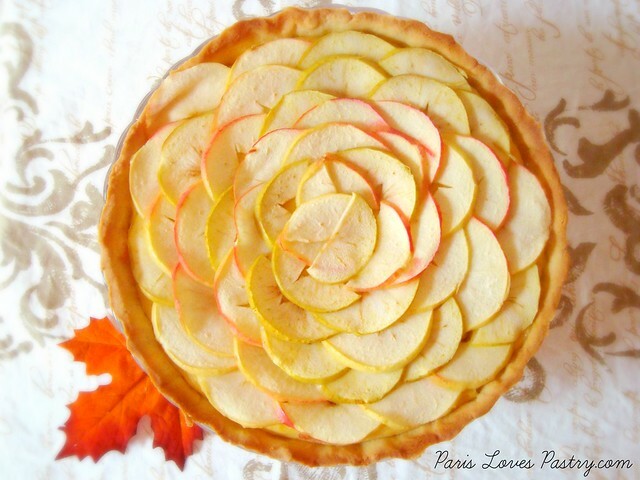 - Spread the pastry cream in a pre-baked tart, and arrange the apple slices looking like the inside of a rose, starting from the outer side of the tart. Don't throw the syrup away! It's delicious to drink straight up or mix in a drink. - Bake the tart for 30 minutes. Let it cool to room temperature before cooling it in the refrigerator - it tastes best when it's cold. 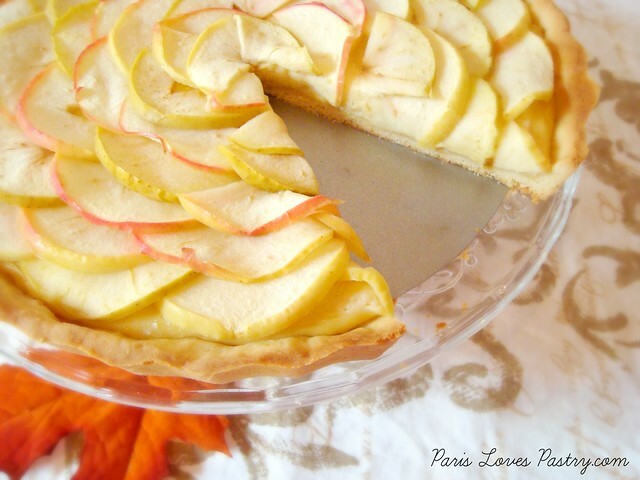 Something amazing about this tart is that it uses white wine in the pastry cream recipe!